The Highlands & Islands ES workshop got off to an interesting start last week as participants were asked “How Big is Your Ego?”. The ES workshop is a peer led, NES supported event providing education and guidance to Educational Supervisors in the Caledonian GPST scheme in the North Deanery. Having completed a short Transactional Analysis questionnaire we arrived in Aviemore with Ego-grams at the ready and our Drivers and Scripts in reserve. 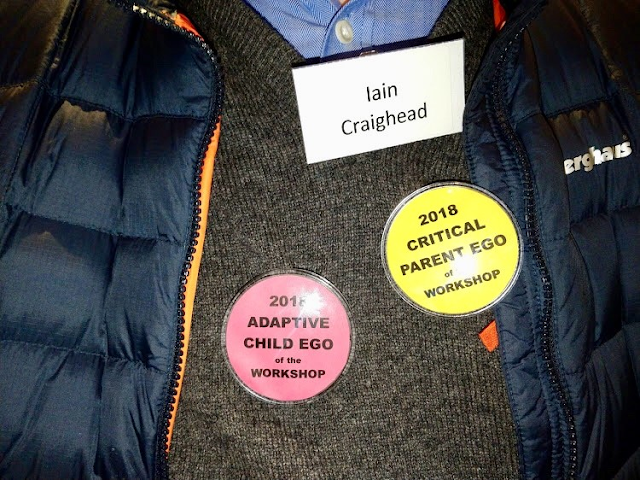 We compared the state of our egos, Adult, Critical Parent, Nurturing Parent, Adaptive Child and Free Child, battling it out for the much sort after ‘Workshop Ego Awards’. As Einstein said “Not everything we count, counts and not everything that counts can be counted”, but on this occasion it was all about the numbers and against all the odds and strong competition Iain Craighead (GP & ES in Dingwall) secured two of these coveted 2018 awards at the workshop. We are not sure what Eric Berne would have made of these antics, but a good start to the workshop was had by all.